Listeners - simple Nasal functions - can be attached to every element inside the Canvas and the Canvas itself. Once a certain action - like moving the mouse or pressing a button - occurs the associated listeners are called. We can use this for example to detect whether the mouse has moved over an element or if a certain element has been clicked. For this you should understand how closures work. For each placement of a Canvas handling events can be enabled or disabled. A Canvas placed in a PUI (old GUI) widget or as standalone GUI window receives events by default, whereas Canvases placed onto the aircraft model or in the scenery do not receive any events by default. Note When using the old PUI/XML GUI with a <canvas>-widget placement, PUI does not trigger any mouseover/hover (mousemove) events. Mouse clicks/wheel/drag are working as expected. For all other placements like on standalone Canvas windows and 3D models there is no such limitation. If you find that your code doesn't work as expected, make sure to verify that your layers (canvas groups) use matching z-index ordering, or overlapping symbols may prevent event handlers from being triggered/called. # and can reach any window or also object covered by the window. Events always are targeted at a specific element inside the Canvas. Before any event handler is called the propagation path for the event is determined. It consists of the event target itself and all its ancestor elements (Groups) up to and including the Canvas. Afterwards - during the Target Phase - all listeners registered on the event target are called. Finally - during the Bubbling Phase - the event bubbles up the tree, following the propagation path determined in the first step, and all listeners attached to the according elements are called. 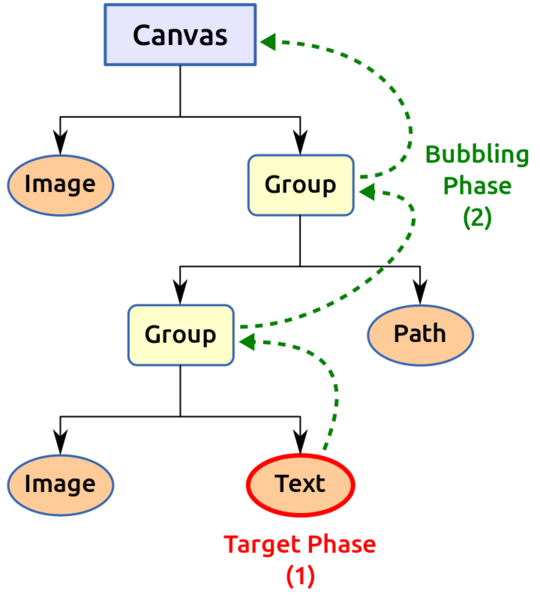 Event flow of Canvas Events similar to W3C DOM Event flow . 2-button mice can be setup to emulate a middle-mouse button click by pressing the left and right button simultaneously. On Ubuntu you can use gpointing-device-settings to enable "middle button emulation"  . .setText( "This could be used for building an 'Aircraft Help' dialog.\n"
This page was last modified on 15 February 2018, at 19:13.